Concord Rangers have been Enfield Town's bogey side since our formation in 2001 when both sides were members of the Essex Senior League. The 0-1 defeat at Donkey Lane last night means that the record books show in nineteen games played against the Essex side Town have only six of those with Concord winning nine and four ending all square. In league fixtures those figures change to three wins for Town, three draws and eight wins for Concord (these figures include the 2010 play-off final) in fourteen games. 20. Saturday 23rd March     2013 Ryman Premier          Away ??? 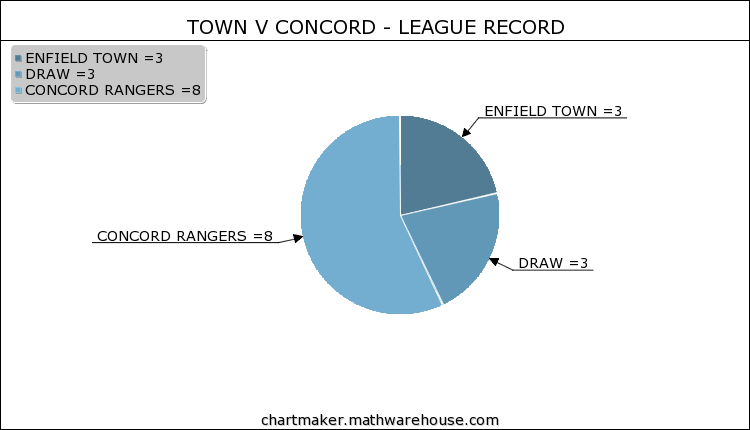 Apart from the first twenty minutes or so Enfield Town were on top in last night's game and can count themselves unlucky not to have at least taken a point after a very hard working performance against Concord who are certainly play-off contenders and even outsiders for the title. Concord passed the ball around well and looked a good physically tough team in the early exchanges but it was Town who came back and asserted themselves going into the half time break at 0-0. Scott McGleish showed he was human by putting a shot just wide of the post when put through by some good build up play by Tyler Campbell and Joe O'Brien. Noel Imber also made a solid save from a Concord effort during the first 45 minutes. The Beachboys made the break through on 56 minutes when a swift taken free kick after a foul had been given allowed a quick break up field for Jason Hallett to scramble the ball into the back of the net from close range. Town thought they were back into the game a short while later when Concord's Leon Gordon was rather harshly adjudged to have handled in the box (see video from 11m 09secs) from a Joe O'Brien shot. It looked more ball to hand with Gordon trying to get his hands out of the way from the shot. TheColdEnd thinks if it was given the other way against Town we'd all be slightly aggrieved. McGleish's resultant penalty smashed against the left hand post and it was about then the thought of it's just one of those nights when the ball just won't go in started to be mentioned on the terraces. There was a what looked like a more blatant handball on the box later on (from 14m 20s on the video) when John Easterford touched the ball with his hand when the ball was coming from left to right across the goal. The referee waved the appeals away and played on though. Town pushed for an equaliser but Concord defended well and won the three points to take back to Canvey Island and add to their promotion push. Both Adam Wallace and Scott McGleish came off with injuries in the second half. McGleish's meant Town going down to ten men for the final minutes as Steve Newing had made all three substitutes already. They are both now doubts for Town's trip to Hampton and Richmond Borough on Saturday. Concord have a busy week as they play at home to Wingate and Finchley tomorrow and then welcome Hendon on Saturday. There are many games left to be played but The Beachboys look almost certain for a play-off spot and a shot at possible promotion to the Blue Square South Division. It seems incredible that a team that were competing against clubs like Clapton, Eton Manor, Beaumont Athletic and London APSA as recently as the 2007/08 Essex Senior League season maybe at the same level of the pyramid as ex football league side's Stockport County and Lincoln City (both currently flirting with relegation in the Conference Premier) from next season. It will certainly be an amazing achievement if it happens! Enfield Town travel to Concord Rangers on Saturday 23rd March for the return league match.